Combine the first 6 ingredients and marinate for 30 minutes. Heat sauté pan over med-high heat; cook shrimp with marinade until liquid has evaporated and shrimp are pink and firm. Allow to cool then finely chop shrimp. Add coconut to mixture and combine thoroughly. Place 1 tablespoon of mixture in the center of a wonton skin. Wet the edges with water, and then fold one corner toward its opposite corner to form a triangle. Make sure edges are sealed well. Repeat with remaining filling. Heat about ½ inch of oil in a pan over medium low heat. Fry wontons until golden brown, about 30 seconds on each side. NOTE: if your oil is too hot, the wontons will burn before cooking all the way. These can also be cooked in a 400°F oven for 10 minutes if you do not wish to fry them, although the texture will be different. 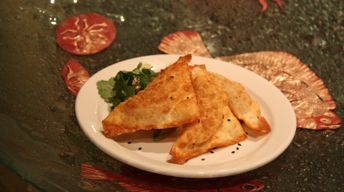 Uncooked wontons can be frozen for up to a week in advance, then fried or baked.